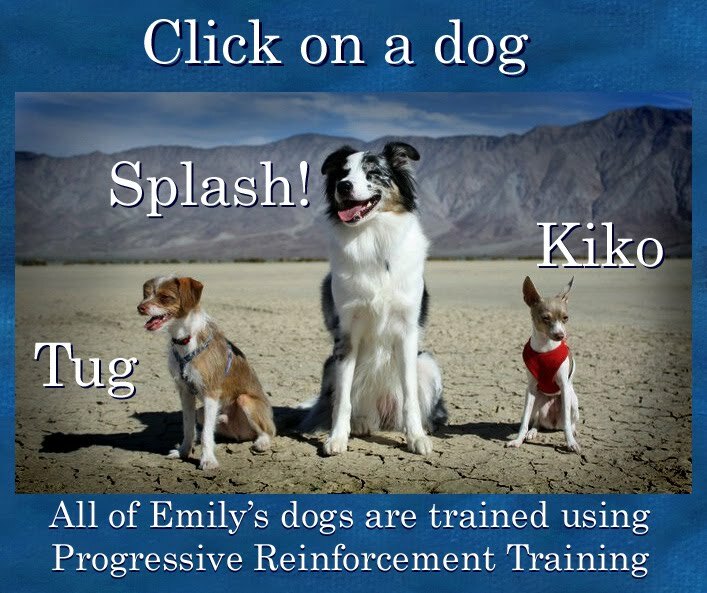 Dogmantics Dog Training Blog: Dog Fancy/Natural Dog Photo Shoot and treats! Yesterday was Splash! 's photo shoot for Dog Fancy/ Natural Dog. She will be on the full page cover of the June issue of Natural Dog, which is on the flip side of Dog Fancy. I was so impressed with my little girl, who had to pose for what seemed FOREVER perched on rocks in the river and above little waterfalls, without getting to touch the water even once. WATER is irresistible to Splashers, so she did very well. At the end of the shoot, she got to dive into the water and then preceded to have major Border Collie Zoomies while the camera crew stood back in awe. 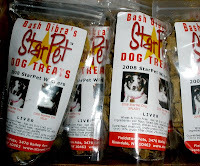 I was also sent some treats in the mail regarding the Starpet contest in NY, cute! There she is with Milo the kitty on the label. How cool is that. I'd love to see a copy of Dog Fancy - my brother lives in Seattle so I'll have to get him to send me a copy.